Cost to be Member of Rotary?? ...As part of the makeup of the Rotary International Organization each club is required to pay a certain amount per each member annually which covers operation costs and a subscription to the Rotarian magazine. Add to that the additional cost of the meeting place and potential meal at every meeting. 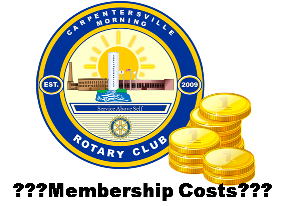 In short membership costs vary from $100 to $200 paid quarterly depending on the individual club. We know that paying this amount every 3 months can be a burden to people who would like to be pat of a club but are unable to make that much of a financial commitment. We are happy to announce a drastic change in our due structure to give people who want to be a part of the club but are not able to pay that much out of pocket. General members are not excluded from having a meal they would just pay it individually rather than include it on the club bill. This new structure gives those who would like to be a part of our club a great opportunity to do so at a much reduced rate and have every opportunity to be included in everything we do to serve others!